If you’re going to hold an event at the Royal Institute you’d better make sure it’s something special. After all this is the home of the famous Christmas Lectures created by Michael Faraday. So when I arrived at Clayton Burnett’s First Annual Lectures on 5th December I was very excited and had high expectations. Lucy Gower told us about a workshop she facilitated for Cystic Fibrosis, where they discussed plans for the charity’s 50th anniversary. They asked people in the room how they felt about their organisations 50th birthday. That was when Laura spoke up. She was the most important person in the workshop because Laura has Cystic Fibrosis. She said she felt jealous because she knew that she was unlikely to reach her 50th birthday. Laura’s contribution instantly changed the mood of the workshop and created a fundamental shift in how the charity felt about its 50th anniversary. So instead of having a 50th anniversary celebration, they are now launching a new fundraising campaign called Cystic Fibrosis is No Party – we won’t celebrate being 50 until everybody can. Salla Saarinen from Finland delivered my second highlight. She explained that Finland is a cold country, both in terms of its weather and emotions. She said she used to be a very logical person and struggled to express her emotions, but her world changed in 2005 when she met her son Valtteri in an orphanage in Johannesburg. The whole experience of adopting him was intensely emotional for Salla. And she shared that her son’s biggest fear is that he will be abandoned again. As he was when he was 4 days old. She believes that charities are just like her son. They just want to be loved and they don’t want to be abandoned. Sally recommended that charities change how they treat their donors. Rather than measuring our donors, we should love them and care for them too. Jayne George of Guide Dogs delivered my third highlight. She told us about the day she met Joe who is a blind, young boy. Joe was being shown around his school so he could ‘orientate’ himself. But Joe’s ambition was not to orientate himself. His ambition was to run around school so he had time to get out and play with his friends at break times. Jayne described how she saw Joe running round the corner and his mum, who had been invited in for the day, saw him and shouted his name. Hearing his mum’s voice, Joe threw away his cain and ran and jumped into her arms for the first time in his life. At that moment Jayne transformed from being a fundraising director to a provider of special moments. She also committed to changing the culture at Guide Dogs to be one that supported fundraising success. The Clayton Burnett lectures had a huge impact on me. They taught me about the importance of stories, people, emotions, innovation, leadership and culture. These are fundamental elements of fundraising. The lectures also reminded me that fundraising is about changing lives, not raising money. And ultimately they inspired me to identify and voice my own ambitious mission. (I’ll say more about that another day). 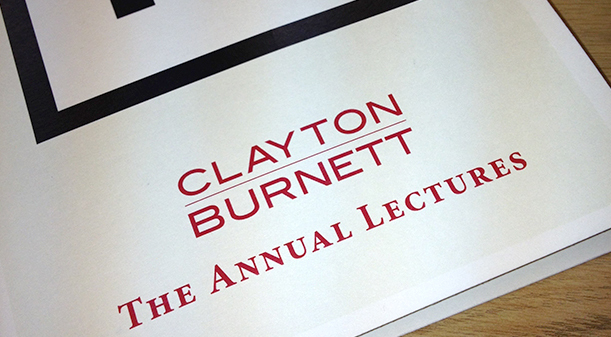 In the meantime I’ll book my seat for the second Clayton Burnett Annual Lectures on 4th December 2014. And I recommend you do the same by emailing dave@claytonburnett.com to reserve your place.